This was one of the few meals I've cooked this season that really took advantage of the delicious ingredients that show up in the spring, in this case new potatoes, new onions and fresh bamboo shoots. 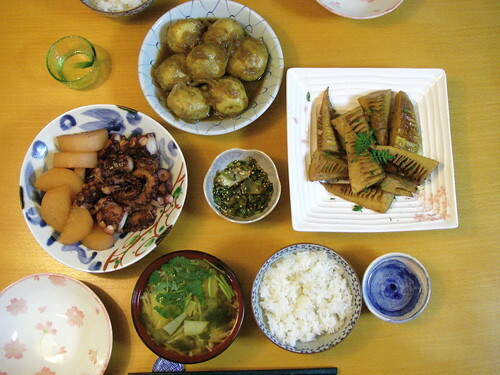 Clockwise from left: tako to daikon no nimono (octopus braised with daikon), shinjaga no nikkorogashi (new potatoes simmered in dashi and soy sauce with new onions), yaki-takenoko (sauteed bamboo shoots), rice, miso soup with wakame seaweed, bamboo shoots and mitsuba (trefoil), and daikon no happa itame (sauteed daikon leaves and peels with sesame seeds). The new potato dish is a favourite, and because it's easy and makes good leftovers I make it often. Recipe here if you're interested. 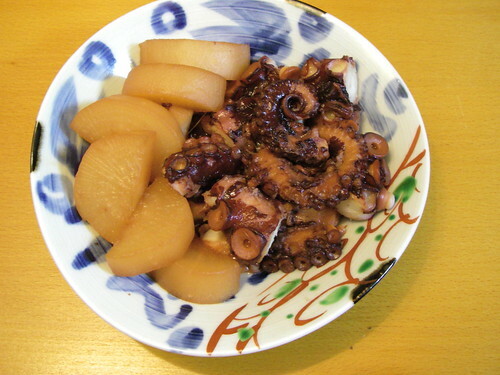 The tako to daikon no nimono is not really a spring dish, but a simple and hearty simmered dish like this is welcome at any season. 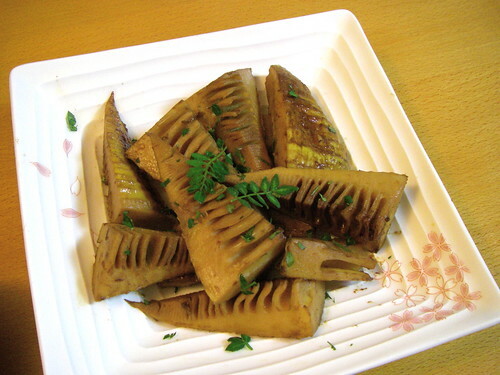 Takenoko (bamboo shoots) are definitely a spring ingredient, and the difference between the pre-boiled shoots available throughout the year and the fresh ones are dramatic. Freshly cooked bamboo shoots have a fresh and delicate aroma and a crunchy texture that don't survive long-term storage, but I usually only get around to preparing them about once per year. 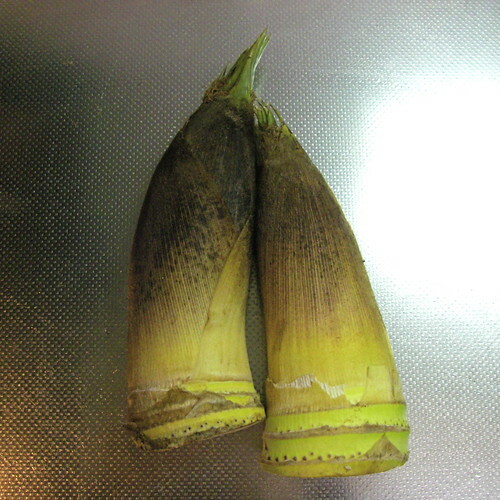 I think I mentioned in a previous post that spring vegetables tend to require lots of work, and bamboo shoots are a perfect example: most types are inedible fresh and need long and careful preparation to remove their ample aku (bitter properties). They must be be partly peeled, then trimmed and scored, then simmered for an hour or so in water with rice bran and a dried chili pepper or two. And then they have to sit around in the simmering water for at least another hour until cool enough to handle (taking them out too early turns them bitter), then peeled and sliced. And only then are they ready to be cooked. I like them best simply simmered in dashi and soy sauce, but since I already had two simmered dishes I decided to add the smaller bits to the soup, then sautee the rest in sesame oil, finishing with soy sauce and sake, and garnishing them with kinome (prickly ash leaves, from the same plant that gives us sansho pepper). It was a lot of work for one meal, but with my first crunchy, fresh-tasting bite I knew it was worth it. I was lucky enough to find fresh takenoko in my local markets, but it's not easy to find out how to prepare them. I ended up with completely peeling and slicing them, and simmering for an hour. They smell wonderful and came out nice and crunchy. I haven't quite figured how to slice them as pretty as you did. Next year! WHAT A WONDERFUL DINNER!!!! THANKS FOR THE INSTRUCTIONS ON PREPARING BAMBOO SHOOTS...I SAW SOME AT THE MARKET LAST WEEK!!! Thanks for the potato and new onions recipe. I tried it last night after picking the ingredients up at the local farmer's market and it was so delicious! And I'm sure the leftovers will be just as good. Also, I've been lurking for a bit and haven't said "hi" -- just want to thank you for all the cooking stories and recipes. I love Japanese cuisine (and not just sushi) but it's hard to find more reasonable "home cooking" recipes and your blog fills that gap wonderfully. Of course, I can't always get the ingredients but what I can do always makes a nice change from the usual. So, thanks a lot! Thanks for sharing this wonderful meal! No bamboo shoots easily available here in NYC but the onions and potatoes recipe looks delicoius. Can't wait to try it! I just love your homecooking recipes! The pictures and descriptions are always very inspiring. I'll surely try out the patatoes soon! wow! that looks sooooo good! A girl I'm interested in is a vegetarian, and I've been cooking for her to impress her. I've been running out of ideas, and I'm glad I got an inspiration (takenoko) from your blog. will come by more often! good day! Your takenoko looks so green compared to the one I got from a road-side grocer. It took forever to cook in the tea kettle. It was very fragrant and tasty, but like you say, they don't survive long even refrigerated. I put them in a stir-fry, but I'll try your sake and soyu version next time. I love your blog. I can't cook worth a damn but I sure do appreciate other people's cooking and your recipes always look delicious. Thanks for sharing such well-written and entertaining posts. Oh where oh where is the latest blog? I'm going through withdrawl! I hope are guys are ok? I'm back from Japan 3.5 weeks and already miss it terribly. Your blog is a lifeline! Thanks for these lovely photos and narratives. I enjoyed seeing live takenoko in the bamboo garden at Tenryu-ji in Kyoto. As I'm not much of a cook, I prefer to look at your artful creations and imagine how tasty they must be! All best to you as summer progresses, bringing with it Japan's notorious heat and humidity and accompanying cooling foods and beverages. I followed you from MJ's blog, I had no idea there was another fabulous foodie girl in Japan!!!! The dishes look DELISH, fabulous photos as well!!!! Awesome Recipe, I will definitely be trying this. I have found that I find so many awesome recipes to try that I need to buy another kitchen or hire a cook :P keep up the nice posts I will be visiting your blog again. place rice at left side, soup at right side, in japanese manner.